Join Coach Simona, a certified Life Coach and Relationship Coach, author of ‘Understanding Men and Women’ and Cognitive Behavioral Therapy Practitioner, as she explores new ways to simplify life and build better relationships with others by rewiring the way your brain thinks. The podcast focuses on bite-sized tips, coaching techniques and CBT tools to slow down your mind and enjoy all life has to offer. In today’s podcast episode, I’ll share with you 5 tips that will help you spend less time on social media and instead, find the time and energy to do more enjoyable and productive things in life. In today’s podcast episode, I’ll share with you 3 tips that will help you stop being obsessed with googling symptoms and learn how to tune into your body instead. In today’s podcast episode, I’ll share with you the 5 most valuable lessons I’ve learned in my business experience so far and what I wish I knew back when I started my coaching practice. In today’s podcast episode, I will share with you 5 burnout recovery strategiesthat actually work and will help you achieve a healthier work-life balance. In today’s episode, I’m going to give you a step-by-step guide on how to meet your own emotional needs. In today’s episode, we’ll focus on a topic with the potential to change your life. We’re going to talk about the differences between guilt and shame, and I will show you how to deal with both of them. In this episode, we will talk about love and I will give you 5 tips on how to keep your relationship strong and healthy. In this episode, we’re going to talk about blame and I will give you my 3 tips on how to deal with false accusations and handle the situation gracefully. In this episode, I will share with you 8 tips on how to stay productive at workwhile staying sane at the same time. Episode 33: Should I Start a Podcast? In this episode, I'm going to answer one of the most frequently asked questions I get, and that is: Should I start a podcast? I'm also going to tell you what I've learned in the past seven months that I've been running this podcast and what I wish I knew back when I started. In today’s episode, I will give you 7 tips on how to become more masculine and live in alignment with your purpose. Hey, my beautiful ladies! In today’s episode, I will give you 7 tips on how to become more feminine and feel more fulfilled in life. In today’s episode, we’re going to talk about nightmares, and I will share with you my 3 tips on how to go back to sleep after you’ve woken up in the middle of the night. Episode 28: Social Media and Isolation: How to Deal with It? In today’s episode, we’re going to talk about social media, what it does to our self-esteem, and how to feel less isolated and more connected to each other. In today’s episode, I’ll give you three in-depth tips on how to be more assertive and a couple of exercises that you can use every day to practice your assertiveness. Episode 26: Should I Work from Home? In today’s episode, I’ll share with you my personal experience on working from home and we’ll learn more about the pros and cons, so that you can decide whether or not that’s something you want for yourself. In today’s episode, we’re going to talk about habits and I will give you my 5-step process on how to build a new habit and most importantly, how to stick to it in the long run. In today’s episode, we’ll talk about self-love and I will give you my 3 tips on how to take care of yourself and accept yourself no matter what life brings. Episode 23: Too Tired to Work Out? Here's What to Do. In today’s episode, we’re going to talk about one of the hardest things you can possibly do: summon the willpower to exercise when you just feel like ‘Netflix and chill’ all day. So I’m going to give you 4 steps that will motivate you to start exercising. In today’s episode, we’re going to talk about vulnerability and I’ll share with you my 3 tips on how to become more authentic with your partner and take your relationship to the next level. In today’s episode, I’m going to talk about quitting and I will show you how to find the motivation to keep going when you feel like giving up. Episode 20: Do I Need a Life Coach? In today’s episode, I’m going to answer one of the most frequently asked questions: ‘Do I Need a Life Coach?’, and explain the differences between life coaching and psychotherapy. I’ll also give you some tips on how to find your perfect fit, no matter what type of help you decide to seek out. In today’s episode, we’re going to focus on contentment, and I will give you my 4 tips on how to feel okay with where you are in life right now and have less resistance to the way things are. In today’s episode, I’ll share with you my 5 steps on how to create a morning routine and most importantly, I’ll give you my advice on how to stick to it. In today’s episode, we’re going to bring up a topic that many people prefer to avoid, and I think it’s about time we changed that! Let’s talk about money, how you can change your limiting beliefs towards it and create abundance in your life. In today’s episode, we’ll explore what your intuition actually is and I’ll give my step-by-step process on how you can tune in and listen to it clearly. In today’s episode, we’ll focus on how to love more and fight less in your relationship. I will give you my 5 tips on how to become a stronger team with your partner and learn to trust and depend on each other even more. Life is too short, we all know that. But how do you actually stop being so serious and start having more fun in your life? Let's find out. In today’s episode, I’ll share with you my tips on how to get unstuck and take back control of your life. In today’s episode, we’re going to explore a topic that’s very near and dear to my heart. We’ll talk about fear of rejection and I’ll give you my best tips on how to overcome it and become more confident and content with who you are right now. Successful people don’t become successful overnight. Today, we’re going to explore what sets them apart from others and what you can start doing today to become one of them. In today’s episode, I’m going to share with you my 5 tips on how to make your partner feel special and have a loving relationship with them. In today’s episode, we’ll focus on a topic with the potential to change your life. We’re going to talk about gratitude and I’ll give you my 5 tips on how to be grateful for what you have in your life. In today’s episode, we’re going to talk about how to get over a breakup and move on with your life quickly. Every breakup is painful and I know you may not be feeling up to anything right now. But, I can assure you, the 6 steps that I’m going to give you today, will help you out a lot when you decide that you’re ready to move on. In today's episode, I'll share with you my best tips on how to get over disappointment, how to set realistic expectations and how to go from ‘holding onto something’ to ‘doing your best and letting go’. In today's episode, we'll talk about the best practices for not letting other people’s opinions dictate our lives. Here's how to focus on your goals and dreams instead of pleasing everyone around you. Did you know that the average person spends about 1/3 of their life at work? Here are 3 ways to maintain a better work-life balance. Today, we're going to talk about personal values. Every single day you have the choice to live a life that’s according to your own values, or according to someone else’s. So choose wisely. This guided meditation is all about tuning into your feelings. It’s a more advanced technique that allows you to focus on any sensation in your body. The purpose of this meditation is to help you relax and feel more at ease. Today’s guided meditation is all about visualization. The purpose of this technique is to take you to a place where you feel safe and relaxed. This helps to reduce anxiety and improves your overall mood. This is a guided meditation intended to help you relax and slow down. The purpose of this technique, called the ‘Focus On Your Breath’ technique, is to get your mind distracted from its own chatter and help you feel more at ease. 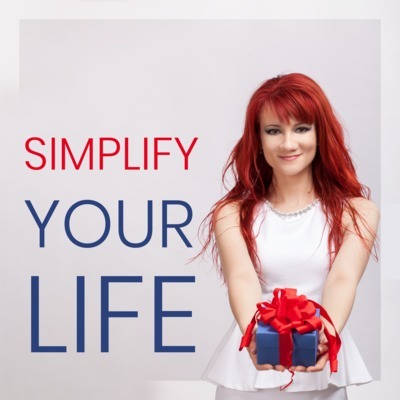 Join Coach Simona, a certified Life Coach & Relationship Coach, author of ‘Understanding Men & Women’ and Cognitive Behavioral Therapy Practitioner, as she explores new ways to simplify life and build better relationships with others by rewiring the way your brain thinks. The podcast focuses on bite-sized tips, coaching techniques and cognitive behavioral therapy tools to slow down your mind and enjoy all life has to offer.